Editor's Note: A version of this success story was originally published by the Energy and Environment Partnership (EEP). Montigny and TechnoServe train local communities to sustainably harvest honey from their timber plots, helping them to increase their incomes while preventing forest fires caused by traditional harvest techniques using smoke. 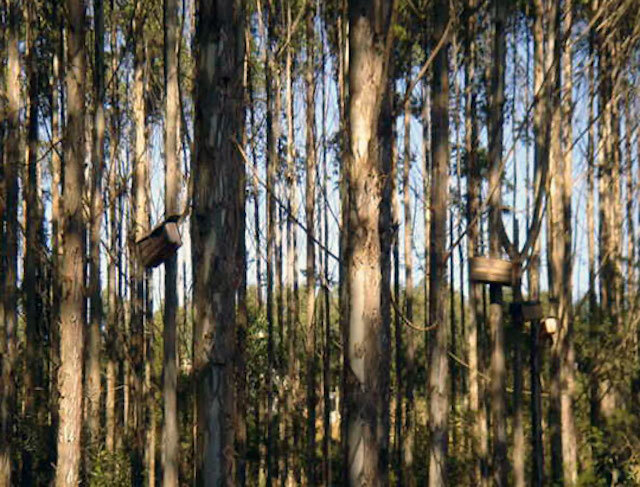 In 2015, TechnoServe and Swaziland timber company Montigny partnered for an EEP-funded initiative to investigate the feasibility of creating carbonized biomass pellets from sawmill residues. Shortly after, the project titled “Maximizing Timber Waste for Energy Generation in Swaziland” started to look at a whole different scale of energy generation. Montigny had just completed a pre-feasibility study for a renewable biomass power plant on its mill site, and the partners found that the optimal use of resources at the sawmill site would in fact be utilizing all available forest residues and sawmill offcuts for a 35-megawatt renewable power plant. While biomass pellets may still be a future option for Montigny, the power plant was recognized to hold the greatest potential for positive environmental, employment and livelihoods upliftment for the nation: a 35-megawatt plant can supply more than 20 percent of Swaziland’s current energy demand. The economic stimulus from the plant will also generate significant savings for the economy, which has typically imported 80 percent of its electricity from neighboring South Africa. Montigny has signed a memorandum of understanding on the project with Swaziland Electricity Company (SEC), and will shortly initiate power purchase agreement negotiations for a 20+ year contract with the utility. The planned power plant will be built at the present mill site in the center of the 55,000-hectare Usutu forest. Montigny currently employs approximately 7,000 local people, which make up nearly 10 percent of the private sector workforce in a country of 1.2 million inhabitants. The power plant will provide a good boost for further job creation. The company has also focused on strengthening community relationships with their neighbors by establishing and communicating policies and programs that benefit both parties for the long term. A great demonstration of this work is the Community Wattle Development, an invasive jungle rehabilitation program where Montigny, together with TechnoServe, have trained local landowners to effectively and sustainably operate smallholder plantations of wattle (Acacia mearnsii). The program has resulted in incomes up to ten times higher for the smallholders, and has simultaneously secured better quality wattle timber for Montigny’s current operations as well as the future power plant. Another combined effort of Montigny and TechnoServe is a honey harvesting training for local villages around the site. The link between honey and the power plant might not be obvious, but sustainable honey harvesting is actually crucial for preventing forest fires that can be caused by traditional methods of evicting the bees with smoke. Honey harvesting can also offer much needed additional income while the landowners wait for their wattle plantations to bring the yield. This project is a great demonstration of what can be achieved with the right partners and timing. By brininging TechnoServe and Montigny together to evaluate the efficient use of timber waste, the EEP-funded project led to plans for creating a whole new business sector in Swaziland. The financing further fast-tracked various studies allowing ambitious plans to get off the ground. Montigny and TechnoServe see the power plant project as the greatest benefit for the future of the company and surrounding communities. The plant is expected to be operational within the next three years, and the partners hope that this success story will be further replicated on various other biomass sites around and outside Swaziland.